Rev. Michael Musick is the LCMS University of Iowa Hospital Chaplain. Email Rev. Musick at ideuichaplain@live.com. For emergencies: Contact Rev. Musick at 319.558.9083. 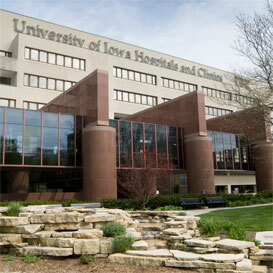 Iowa District East has a University of Iowa Hospital Chaplain who is able to visit your parishioners. Please contact Rev. Musick if you are not able to make it to Iowa City to visit your parishioners. Chaplaincy Endowment Fund: The Chaplaincy Endowment fund is currently over $460,000! (as of 9/30/18) After it reaches $500,000, the earnings will go toward supporting the chaplaincy at the U of I Hospitals. All gifts will be used for growing the fund with the goal of supporting a full time chaplain at University Hospitals. Please make donations to Iowa District East and designate to the Chaplaincy Endowment. To do this, send a check to the address listed below and writing “Chaplaincy Endowment Fund” in the memo line. Hospital Chaplaincy Fund: The Hospital Chaplaincy Fund is used for the current operating expenses of the Hospital Chaplain. As of January 2015, Chaplain Musick is visiting the hospital five half days a week. Please make donation to Iowa District East and designate to the Hospital Chaplaincy Fund by writing “Hospital Chaplaincy” in the memo line.